This late-blooming Tulip is a joy in the warm spring garden. Much more tolerant of heat than most others, it extends the season with big, beautiful blooms of rosy-pink with lighter edges. A treat for garden or vase! Pink Diamond is a Mayflowering Tulip, arising in late spring on sturdy, robust plants. Very long-lasting, it op0ens slowly to reveal its wide, bowl shape and rich interior. No wonder it's been a favorite for so many years! 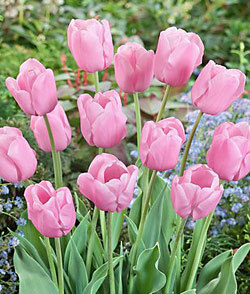 This Tulip reaches 18 to 20 inches high, and combines well with other Mayflowering varieties.